Yesterday, we saw Denard locking onto receivers when he gets man coverage on the outside without safety help over the top. This resulted in an incomplete jump ball to Roy Roundtree that could have just as easily been intercepted. In an effort to find something (anything) to write about in the most dull game of the last three years, I noticed that both of Denard's interceptions in the game were the result of him locking onto receivers. 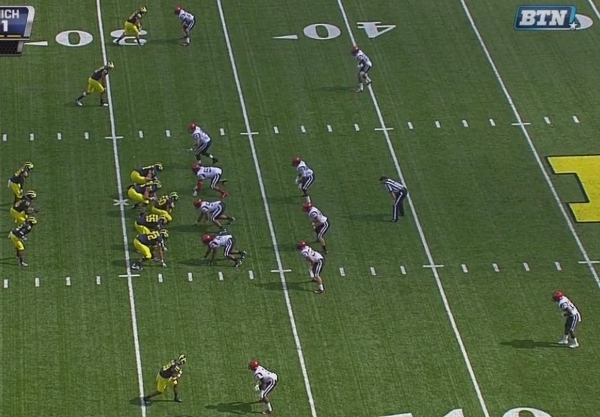 Michigan is in a three-wide set with two RBs flanking Denard. Jeremy Jackson is in the slot and Drew Dileo is the outside receiver on the strongside of the field. San Diego State is in a 3-4 defensive formation. On the snap, Denard rolls out left. Jackson is running a 10-yard hitch route. Dileo will run a circle route to the outside (YMRMFSPA: Forcier to Matthews to beat Notre Dame in 2009). 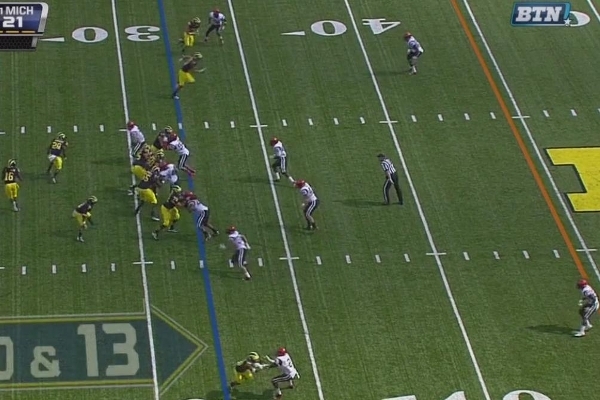 SDSU rushes four and is in zone coverage but will jam the outside receivers. As Denard rolls out, Dileo plants his foot to break to the sideline. Jackson will continue upfield. At this point, the SDSU corner covering Dileo is reading Denard's eyes and starting to sink downfield on the hitch route. 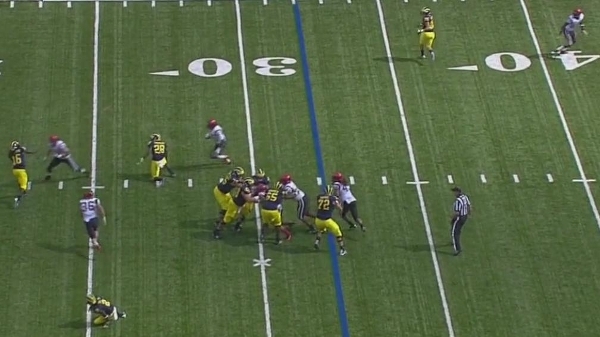 Dileo is breaking to the outside and will be wide open in a minute. When Denard finally squares his shoulders to throw, the SDSU corner is completely abandoning his assignment because Denard is staring down Jackson downfield. Dileo is breaking open to the sideline as the corner's momentum carries him downfield. As Denard lets go of the ball, Dileo is wide open and the SDSU corner is dropping to make the interception. In this scenario, Denard needs to recognize the coverage and see the corner sinking off of Dileo who is wide open. He has time in the pocket to throw and no one in front of the underneath route. It's likely that Denard saw Jackson run unabated through the underneath zones and stared him down, allowing the corner to read the route and make the interception. His second pick wasn't exactly the same, but it does show Denard failing to see the whole field. We'll jump to right before the throw. The pocket has collapse around Denard and he has stepped into the vacated zone. Directly in front of him, Kevin Koger is being guarded by one of the SDSU linebackers. To Denard's left is Dileo breaking open on a hitch route. As Denard releases the ball--sneaking it just past the outstretch hand of a spying linebacker--the SDSU linebacker covering Koger reads his throw and jumps in front of the passing, tipping it in the air for an interception. More than throwing to a covered receiver, Denard probably just needs to run the ball. But if he decides to throw it, he needs to recognize Dileo open on a curl route (top of the screen). It wouldn't surprise me if, when rewatching some of Denard's other interceptions/ill-advised jump balls, he continues locking onto receivers and making up his mind before the ball is snapped. The good news is that this is correctable (I think). Read progression is a major factor in a pro-style offense, and Denard hasn't experienced a whole ton of it. The coaches are almost certainly going through his reads on a daily basis and working to correct these sort of vision problems. In the same way that Denard and Tate Forcier improved their vision under the previous regime, expect Denard to improve here. I think this is spot on. But even if he were making the best decisions his throws will still be inaccurate. On both of these picks his mechanics are terrible. 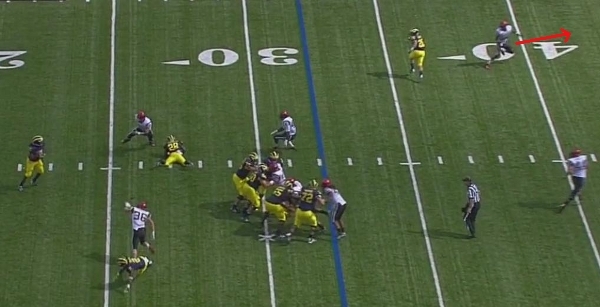 On the first, he steps towards Dileo when he's throwing well downfield of him. In the second it looks like he steps with his throwing-arm foot. These types of mechanical issues make throwing accurate balls next-to impossible. I've never been a "Denard to running back" guy but these issues are fundamental to throwing a ball and it worries be that he'll won't get them resolved.